The idea for this card came to me last night as I was trying to get to sleep, I should have gotten up and headed to the studio and got to work, as I didn’t sleep well anyways. I also knew I was going to pair up these TWO great challenges for this piece….Pink Power Diva Dare over at Verve and the Tag You’re it Challenge #8. My mom was a Breast Cancer survivor for many years, so I try to make at least one card a year to commemorate her. Unfortunately later on in life she got Ovarian cancer and wasn’t as lucky to beat that battle. Love and miss you mom! This afternoon when I was ready to get started I found another piece of my all time favorite DP and knew it would work perfectly! SCORE!!! Now I knew I wouldn’t fail! 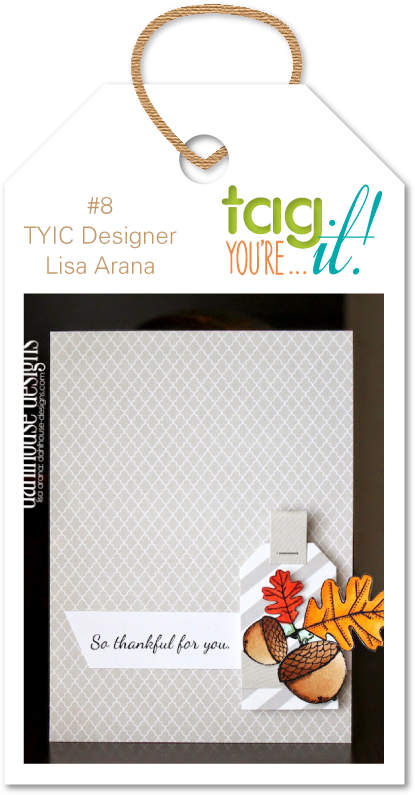 Onto some details: For this card I used my new favorite border die cut from Verve as well…love those hearts! It comes in a pack of 3 and it’s a must have…I linked it up for you. Next, the hearts and sentiment are also from Verve and come in the With Love Set. I used versa mark and stamped them on the background. 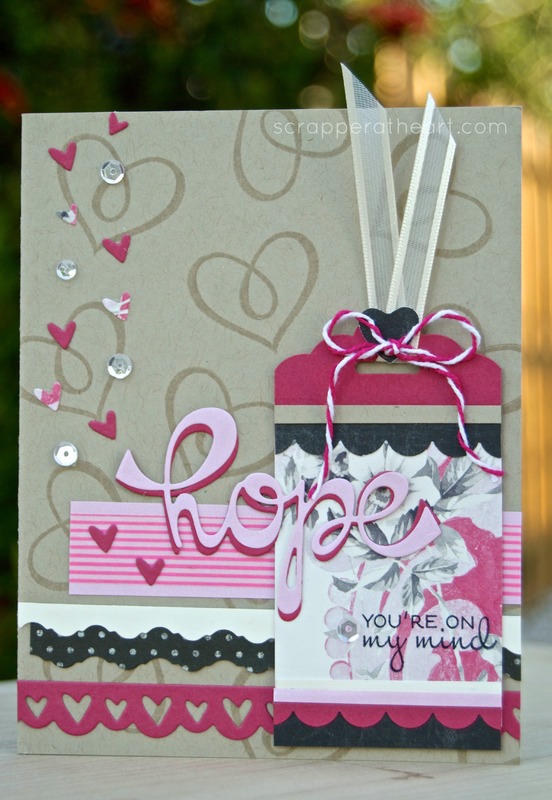 The word HOPE is a die cut and is from Paper Smooches. I cut it out twice for a drop shadow. The striped paper is actually made with a piece of Washi tape. The sequins are also from Verve and the small hearts are from the inside of the die cut. The basic tag was made with the SU punch and lots of paper piecing, which is what I love to do! I so appreciate you stopping in and your words of encouragement! Hope you have a wonderful day and I have inspired you a little bit! Categories: Cards | Tags: Card making, Cards, hope, rubber stamps, stamping, Thinking of you, Verve Stamps | Permalink. What a lovely card and a nice tribute to breast cancer awareness! Thanks Denise, My mom had breast cancer and I try to commemorate her at least once a year…thanks for your kind words. Another wonderful card for the Cancer Cause. Very pretty. Love the border die also and all the elements of your card. I agree, it is a great tribute to breast cancer awareness. This card is a great tribute to your Mom and your memories of her. Love your card and the story about your Mom. If only we could have them back for a day. What a beautiful card in remembrance of your Mom, Nancy. Love the two shades of pink with the gray/black/white colors. Your card could also be entered at the Sisterhood of Snarky Stampers, for the H is for Hopeful Halloween challenge. The challenge is to make either a pink card for BCA month ( which this qualifies for) , a Halloween card, or combine to make a pink Halloween card. This is beautiful! Wonderful take on Lisa’s card! What an amazing way to celebrate your mom. I think art that truly speaks to something personal is just so beautiful. Thank you for sharing and for helping to spread awareness about such an important cause.